When you crave a dessert but want to stick to your healthy eating plan, here are two clean and delicious recipes you can try! 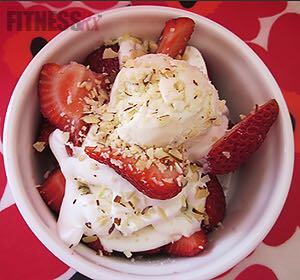 This is the perfect high-protein dessert for a guilt-free snack in the afternoon— or anytime! This recipe has healthy fats, carbs and protein. Place your almond butter, whey powder, almond milk and water in a bowl. Mix all the ingredients until thick. Freeze for at least one hour. When the mix is ready to serve, just put the strawberries, blueberries and the almonds on top. Enjoy this delicious, easy and healthy recipe! 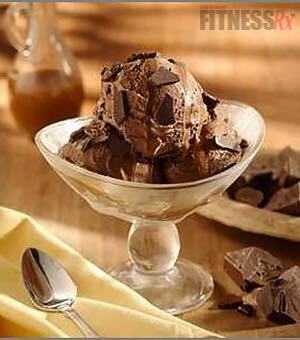 This is another delicious high-protein ice cream option without fruit. Low in calories and low in carbs, this is a recipe for anyone who really craves chocolate— like me! Place your almond butter, whey powder, almond milk and water in a bowl. Mix all the ingredients until thick. Freeze for at least one hour. When the mix is ready to serve, just the put the grated dark chocolate on the top. Yummy! This recipe can be for two snack meals.